Since our last update (January 29th), FOTOCAT has added 1,080 reports to reach the present number of 8,250 entries in the database. This is partially due to an input of near 700 cases from Norway (almost 500 from the Hessdalen area) in the context of a special study we are performing on this country (see below). We have also added to the listing several photographic cases pre-dating year 1900 that were previously in a separate file. In this way the catalog will not lose a few historical precedents of interest. The evolution of FOTOCAT, as a databank of UFO sightings, is slow but sure. From its inception, the catalog's structure has evolved significantly. Now, paired with the preparation of specific research works on Norway, Chile, Argentina, etc., it has been decided to include one more column in the spreadsheet: duration, in order to record the time the phenomenon lasted, expressed in seconds. This is a variable that seems to be important to be retained as a standard feature. We trust this addition will improve the analytical possibilities of the database. For new reports entered, this data is being registered. For past cases, this will be included in line with work progress and the cooperation of local investigators. FOTO 2: Piles of archives ready to be processed to create Norway FOTOCAT. The result has been quite spectacular and a paper is being writing at this moment to describe the cases collected and to analyze the data. We have created the figure of “FOTOCAT National Coordinator”. It will be granted to the person who volunteers to be the central point for collection, processing, and data reduction of photographic cases to be provided to FOTOCAT for a given country or State. This person will coordinate with other local ufologists the acquisition and entry of data to the catalog. FOTOCAT Project will gladly consider any offers from elsewhere. Finish UFO researcher Björn Borg has been appointed National Coordinator for Finland. We must say thanks to correspondents who are sending us material for the catalogue, like David Kinsella, from Malta and Dimitri, from Greece. Ramón Álvarez, from Barcelona, for sending clippings of news and articles published in the Spanish commercial UFO magazines in the last years. 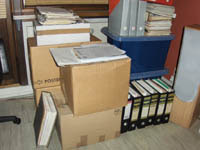 Joan Plana, who is retiring from ufology, is submitting bunches of materials of interest. Anders Liljegren, from Sweden, for sending a lot of issues of journals containing cases for the catalog. And hailing from Chile, Rodrigo Fuenzalida, the leader of AION group, is another source of documentation for reports in his country. To Luis Burgos (Argentina), for his annual reports on UFO cases. And last but not least, Andrés Duarte, a young Chilean scientist whose expertise in image analysis is serving our project to know more about the actual nature of certain events. Exemplary help is being provided by veteran UFO investigator Tom Benson, from New Jersey (USA). Tom is checking collections of old UFO periodicals and journals like Max Miller’ s Saucers, Gene Duplantier’s Saucers, Space and Science, Fate, and others in search of information covering UFO picture reports, which are mailed to us in the form of Xerox copy. Thank you Tom! We are happy to announce that we have succeeded to find the originals of two pictures that were taken at 06,20 hours from Sidi Ifni (Spanish Sahara by then, Morocco today), on February 15, 1964. Bad reproductions of these photos have been published in some magazines and even in a couple of books, always without the consent of the author, and with serious mistakes in the description data. We are grateful to Jaume Sacasas, who saw a distant, reddish globe of light in the sky one morning during his military service in North Africa and he decided to take time-exposure pictures of the phenomenon. 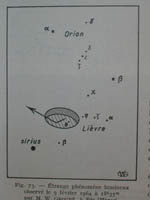 As an astronomer aficionado, he later found an article in the French journal L’Astronomie of May 1964 where W. Groubê described the observation of a similar sky event on February 9, 1964 from Fès (Morocco). It was also sighted as far as from Oran (Algeria). FOTOS 4 and 5: Sidi Ifni, Spanish Sahara, February 15, 1964. © Jaume Sacasas. The author of the photographs decided to inform of his own observation to the journal, and a brief note was published in the April 1966 issue. Both sightings described a luminous dot as large as 7º in angular size, which was moving slowing and dissipating over 20 minutes. This appearance fits well with a space experiment. We have reviewed launching annals of the Hammaguir French space center in the African desert and found that both on February 9 and 15 Centaure rockets were launched to spread into the atmosphere Na (Sodium) and Ba (Barium) clouds, respectively. This absolutely solves the strange observations. We are pleased to include here first-generation prints of both photographs. FOTO 6: Graph showing the altitude of 8 airplanes from where the UFO was witnessed. © CBA International. 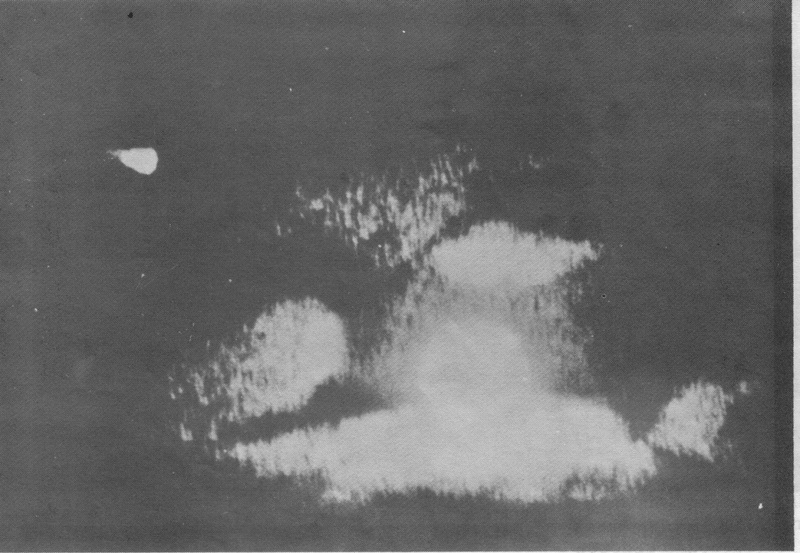 There was a multiple entry in FOTOCAT for an awesome aerial display over several cities of Japan at 18,14 hours of October 3, 1971. 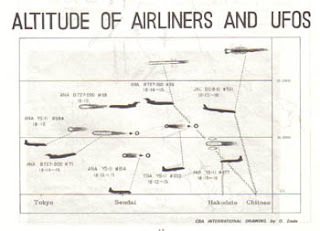 In this particular case, the Japanese CBA International’ s UFO News journal reported in its August-September 1974 issue a wide dossier about the incident, one which was observed by the crews of several airliners. In Europe, ufologists were informed by the excellent SOBEPS magazine Inforespace, where this case was commented by Jean-Luc Vertongen in September 1976. 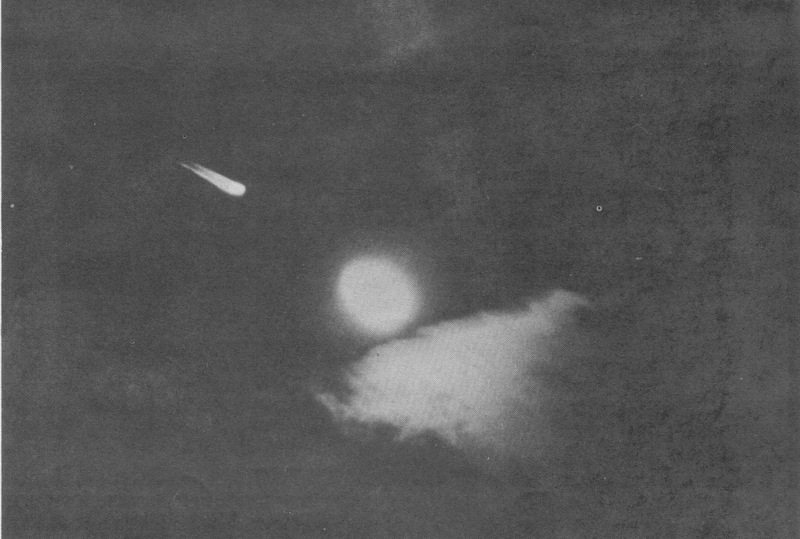 Basically, a powerful fireball illuminated the skies near the position where the Moon was placed in the heavens. It was observed by large number of people, who rushed to inform to police stations, meteorological observatories and newspaper offices. For some 30 seconds the atmosphere flared up into flames. At least, 5 different series of pictures were achieved from the cities of Sapporo, Hokkaido and Honshu. We are presenting here 3 of these pictures. FOTO 8: FOTO 8: Photograph made by Yasunobu Goto of Sapporo. © CBA International. FOTO 9: Photograph taken by staff of Touo Nippo newspaper of Honshu. © CBA International. Following one of these unwritten laws of ufology by which any massive-sighted UFO sighting is prone to a conventional solution, I resolved to consult the NASA log of spacecraft decays. Space-Track reported only one reentry for this day, the rocket booster of a Russian satellite that had been placed into orbit just 5 days before. Thanks for your interesting email and for the attachments. 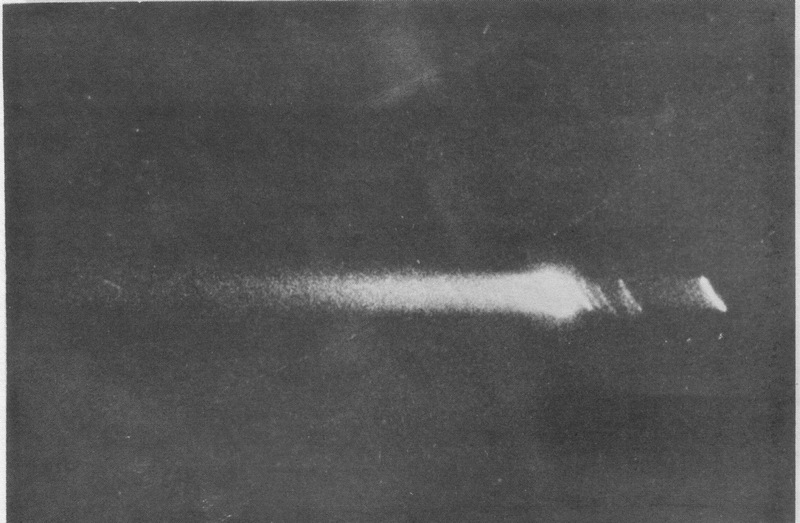 I think there is a very good chance that the fireball over Japan on 1971 Oct 3 was, indeed, the decay of the Cosmos 441 rocket, which I believe was the third stage of a Voskhod 11A57 rocket. Unfortunately, the final elset (element set) I have for this was issued more than 10 hours before the Japanese sighting, so there must be an uncertainty of a few hours (perhaps 3 hours) in the decay time derived from it. Taken alone it indicates a decay shortly before 11:00 UT (=GMT). However, in combination with elsets from a few hours earlier, I estimate that the decay could well have occurred earlier, even as early at 07:00 UT. I believe that a local time in Japan of 18:14 converts to a UT time of 09:14, which is nicely in the spread of possible decay times from my estimates. I have omitted any height estimate here, but if it was visible during re-entry then it is likely to have been in the range of about 90-30 km above ground. However, do not make the mistake of assuming that it would have been falling sharply while it was burning up, the drop in altitude the during each minute while it was self-luminous may have been of the order of 10 km or so. As you see, this track follows a SE path directly over the island of Hokkaido between 09:14 and 09:15 UT, passing (I think) less than 100 km NE of Sapporo. There must be a little uncertainty about its position along the path. If it were to have been one minute early then the path would be exactly 15 minutes of longitude E of this line, and if it were one minute late then the path would shift W by the same amount. In fact, I doubt whether the time error would have been as much as this. The photos from Sapporo suggest that the object passed just above the (almost full) Moon, which would have been 20 degrees high in the ESE (azimuth 110 degrees) at 18:14 local time. Although there appear to be a few stars on the images, I am unable to identify these - there was obviously some cloud which was makes the identification difficult and some of the "stars" may not be real. However, I think that the direction of motion as seen from Sapporo (disappearing towards the SE, to the right of the Moon), as well as the sightings from the other locations (though you don't report angular altitudes), are in good agreement with this re-entry as being the cause of the reports. I suspect that the sighting from the Tokyo area must have put the object very low across the NE sky. In Ufology few things are more final than an exact explanation for a UFO sighting. As we have seen in the present example. Our colleague Ole Henningsen, a respected ufologist from Denmark, has been kind enough to transmit to us a few pictures taken by Viktor Svendsen, a Danish tourist in the south coast of the Gran Canary island (Canary Islands, Spain) on the evening of March 5, 1979, when the effects of the firing of 2 Poseidon missiles, launched from an submerged submarine platform by the US Navy in the Atlantic test range were sighted by plenty of citizens, local and visitors. The images are not very impressive but these add to a large collection of such prints FOTOCAT Project has assembled together of an occurrence that initially was taken to be a UFO. FOTO 10: At 20,07 hours, a missile is vectored from the horizon to the heights. Many fortuned witnesses could take photographs of this fiery vision. © V. Svendsen/SUFOI. In fact, that dusk there were 4 missiles launched by the US Navy in total, but only the after-effects of two of them were observed from the Canary archipelago. Readers interested in learning more about this are advised to read the paper “¡Identificados! Los OVNIS de Canarias fueron misiles Poseidón” (by Vicente-Juan Ballester Olmos and Ricardo Campo), Revista de Aeronáutica y Astronáutica, March 2001, in http://www.ikaros.org.es/misiles.htm French translation in La Gazette Fortéenne, August 2002, pages 229-246, and English translation in International UFO Reporter, July 2005, pages 3-9 and 26. By coincidence, I was revising the CEI photographic file on this event when the new photos came in. And I happened to find a yet unknown picture of this case amongst the CEI materials. 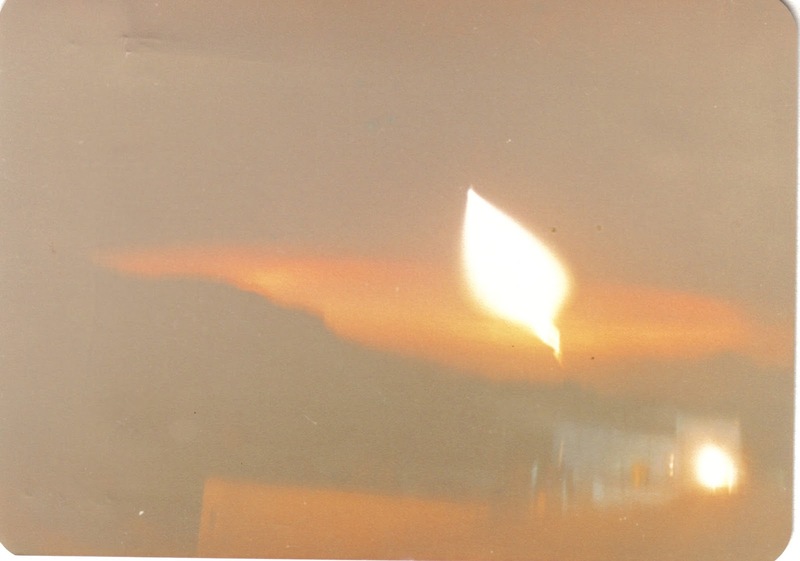 Although a low-quality photo, it shows the magnificent plume left by the ballistic missile in its flight. Unfortunately, we do not know who took it or from where in the Canary Islands. 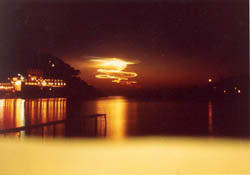 Speaking of recovering old pictures and rocket firings, Ole Henningsen also sent us another snapshot taken by a Danish tourist in Sóller, Mallorca Island, Spain, on the evening of June 12, 1974. At 22,00 hours of that day, a MSBS ballistic missile was launched from the Centre D’Essais des Landes, Biscarrosse, France. 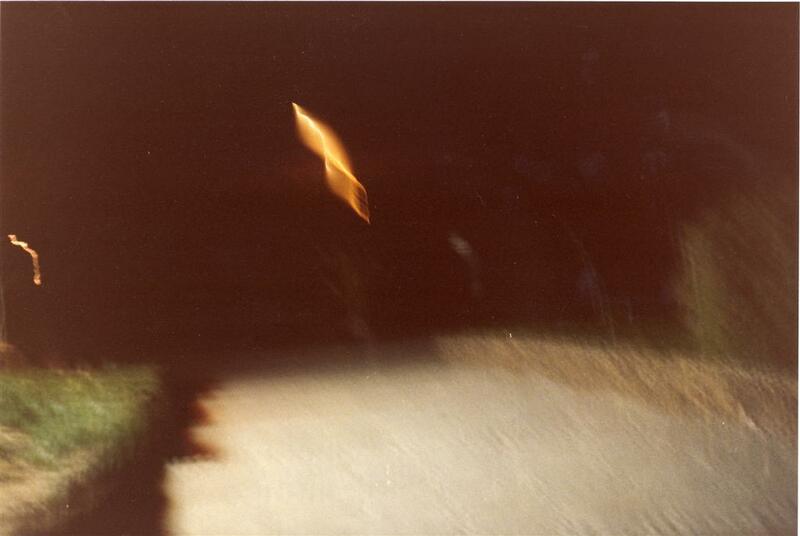 The luminous trace of the firing was sighted by multitudes from Spain and France many series of pictures were achieved by observers. Clearly, wave years pop up in 1952 and 1954, with double of cases reported than the rest of years. In terms of report harvesting, 1951 is the poorest year, with half of the reports of non-wave years. Roughly, 50% of cases are explained and 50% unexplained. 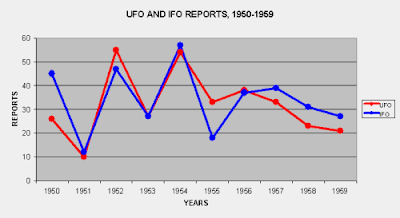 The IFO rate is 3 percent points over the UFO rate, however. This average is rather constant along the decade, only years 1950 and 1955 deviate from this pattern, yet in opposite ways. 1950 has the largest percentage of solved events, probably by the effect of the numerous balloons pictured over Mexico, the false humanoid photographs of April, and various Adamski pictures in the tally. On the contrary, 1955 shows the highest rate in unsolved stories. I do not have a clue. Not unexpectedly, the United States of America is the star country, outweighing considerably the figures from any other country. In fact, USA itself represents 54% of the total. Italy and France follow, in a lowest rank, basically because of their prominent input during the 1954 wave. FOTO 13: One of the views of the “flying saucer”, allegedly flying over El Saler beach (Valencia), on March 5 , 1969. Last December 27th, died the Catalonian businessman Rafael Farriols Calvo, best known in this field of ours as co-author in 1969 with Antonio Ribera of the book Un Caso Perfecto (A Perfect Case), dedicated to the prank photographs taken at San José de Valderas (Madrid) on June 1967. Obsessed up to compulsive limits with the so-called reports from the UMMO planet (morbidly created in reality by a psychologist from Madrid, José Luis Jordán Peña), Farriols collected the largest existing archive around this myth, one which has just deceived to credulous people and to those who have become hypnotized by their preconceived beliefs. FOTO 14: Close-up of another of the prints of the series. In relation to this sad news, I would like to remember an anecdote related to first my personal meeting with Rafael Farriols. In April 1969 I had founded and was managing CEONI, a UFO association based in the Valencia University campus. One day, while collecting the mail in our premises allocated by a University College, I found a letter (with no sender information) which described the sighting of a flying saucer maneuvering over the nearby El Saler beach on March 5, 1969. A set of photographic prints were enclosed. The special feature was that on the base of the craft there was the UMMO emblem )┼( One that reminds us the Russian Cyrillic character Ж.
FOTO 15: From left to right, Rafael Farriols, V.J. Ballester Olmos, CEONI staff, and Antonio Ribera. El Saler (Valencia), April 1969. The sender, without advancing any personal identification clue, was simply dating me for an encounter on the following Saturday evening in a nearby coffee shop. A café, precisely, where CEONI members used to go to have a drink after our weekly UFO meetings. Without hesitating, I called Antonio Ribera in Barcelona (our national expert on UMMO) to inform him about the photographs. Next Saturday, the Ribera-Farriols team was in Valencia in search of impossible proofs. To make a long story short, when I was to the established meeting point, no-one made up, causing a general deception. On the following day, a few of us, including our two distinguished visitors, made an expedition tour to the Valencia beach. As expected, we got no confirming information about the reported UFO presence. 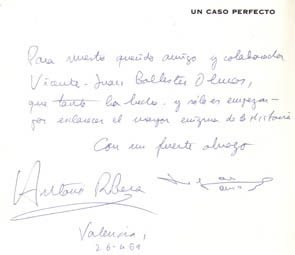 FOTO 16: Final memory, a kind inscription from the two authors of the book Un Caso Perfecto. Months later, a couple, both students of Medicine and members of CEONI, came to confess to me that it had been just an innocent hoax but they were frightened when they appeared in our center and realized the effect it had caused, including the presence of these two ufological gurus. The truth is that that first and unique hoax I have received in my life –when I was just nineteen- served me to become even more down to earth and it helped to give shape to a healthy skepticism that I believe it must be a guide to any researcher who searches for the truth in this rarified subject matter. Desde la última actualización ordinaria de este blog (29 de enero), FOTOCAT ha añadido 1.080 informes hasta alcanzar la cifra de 8,250 registros en la base de datos. Este notable incremento se debe en parte a la entrada de cerca de 700 nuevos casos de Noruega (500 de los cuales proceden de la zona de Hessdalen), en el contexto de un estudio especial que estamos realizando sobre ese país (ver más adelante). También hemos añadido al listado varios casos fotográficos anteriores a 1900 que teníamos en un archivo independiente. De esta forma incorporamos al catálogo dichos interesantes precedentes históricos. La evolución de FOTOCAT, como banco de datos de observaciones ovni, es lenta pero segura. Casi como un organismo vivo, la estructura del catálogo ha evolucionado significativamente desde su creación. Ahora, aparejado con la preparación de estudios especiales con casuística de Noruega, Chile, Argentina, etc., se ha decidido incluir una nueva columna en la hoja de cálculo: duración, con el propósito de anotar la amplitud temporal del fenómeno, expresada en segundos. Esta es una variable que juzgamos importante retener para futuros estudios. Creemos que esto mejorará las posibilidades analíticas de la base de datos. Para cada nuevo caso que entre se registrará ya este dato. Para los casos pasados, iremos incluyéndolo a medida que desarrollen proyectos de trabajo y colaboración con estudiosos locales. a la región de Hessdalen en Noruega se le reconoce mundialmente como una zona en la que se desarrollan sucesos luminosos anómalos frecuentemente. Con la finalidad de convertirse en un estímulo para el largamente esperado censo completo y al día de la actividad fotográfica en la zona, hemos desarrollado un catálogo preliminar de las fotografías, películas y vídeos de supuestos ovnis logrados en Noruega, 1900-2005. este catálogo pone en su adecuada perspectiva histórica y nacional los fenómenos que se suceden en Hessdalen durante los últimos dos siglos, en relación a otros sucesos no identifificados en el país, que sirva como referencia sobre la observación de fenómenos aéreos, luminosos o no luminosos, explicados o no explicados. FOTO 2: Pilas y pilas de archivos revisados para la creación de FOTOCAT Noruega. Para recopilar tan ambicioso catálogo nacional, se han tenido que revisar en detalle colecciones de revistas especializadas, libros y archivos varios, para localizar todas las informaciones aparecidas sobre casos fotográficos ovni acaecidos en Noruega. Como muestra la fotografía siguiente, se han procesado volúmenes enormes de materiales y bibliografía, con esta finalidad. El resultado ha sido espectacular y el ensayo que estamos escribiendo pretende describir minuciosamente los casos recogidos, al tiempo que se presenta un análisis de conjunto de los datos recabados. Hemos creado la figura del “Coordinador Nacional FOTOCAT”. Se otorgará a la persona que acepte desinteresadamente convertirse en punto focal para la recopilación, procesamiento y documentación de casos de un país determinado, para su ingreso en la hoja de cálculo y archivos del proyecto FOTOCAT. Esta persona hará de coordinador con otros ufólogos locales y suministrará datos directamente al catálogo. Como gestor del proyecto FOTOCAT estaré encantando de recibir propuestas a este respecto. El investigador ovni finlandés Björn Borg ha sido nombrado Coordinador Nacional para Finlandia. Esta vez tenemos que agradecer a varios corresponsales que nos han remitido material para el catálogo y es un placer citarlos seguidamente. David Kinsella, desde la isla mediterránea de Malta. Dimitri, de Grecia. Ramón lvarez, de Barcelona, por su remisión de recortes de noticias y artículos de prensa de revistas comerciales sobre lo paranormal publicados en los últimos años. Al investigador catalán Joan Plana, que el retirarse de la ufología ha tenido a bien facilitarnos lotes de material de sus archivos. Anders Liljegren, de Suecia, por mandar muchos números de revistas especializadas conteniendo casos fotográficos. Y desde Chile, agradecemos a Rodrigo Fuenzalida, dirigente del grupo AION, por documentarnos acerca de informes ovni de su país. Al argentino Luís Burgos, por sus útiles informes anuales de casuística. Y por último, y no menos importante, a Andrés Duarte, joven científico chileno cuya experiencia en análisis de imágenes ha puesto a nuestra disposición para la resolución de fotografías enigmáticas. Colaboración ejemplar nos ha sido ofrecida por el viejo amigo y veterano estudioso Tom Benson, de New Jersey (EE.UU.). Tom va a revisar colecciones de revistas antguas como Saucers (de Max Miller), Saucers, Space and Science (de Gene Duplantier) o Fate, en la búsqueda de informaciones que tengan que ver con avistamientos ovni fotografiados, que nos serán enviados en forma de fotocopia para nuestros archivos. ¡Muchas gracias, Tom! Esta sección visita ciertas fotografías de pasadas décadas, aportándoles una nueva interpretación. FOTO 3: Ilustración aparecida en el número de mayo de 1964 de L’Astronomie, de un “extraño fenómeno luminoso” visto el 9 de febrero de 1964. Estoy especialmente satisfecho al anunciar que hemos tenido éxito en encontrar los originales de dos fotografías que se tomaron a las 6,20 de la mañana del 15 de febrero de 1964 desde Sidi Ifni (Sahara español, hoy Marruecos). Malas reproducciones de estas fotos se publicaron años atrás en algunas revistas e incluso un par de libros las piratearon sin el consentimiento del autor, además de agregar serios errores en la descripción de los hechos. Estamos muy agradecidos a su autor, Jaume Sacasas, quien aquella madrugada observó una lejana mancha globular rojiza en el cielo, mientras que hacía su servicio militar en aquella antigua plaza de soberanía española. Tuvo la acertada idea de sacar un par de fotos con exposición de algunos minutos. Como aficionado a la astronomía que era, tiempo después encontró un artículo en la revista francesa L’Astronomie de mayo de 1964 en el que W. Groubê describía la observación de un fenómeno similar avistado desde Fes (Marruecos) el 9 de febrero de 1964, que pudo ser visto también desde Orán (Argelia). El autor de las fotografías decidió informar de su existencia a la revista, que publicó una breve nota sobre las mismas en su número de abril de 1966. Las dos observaciones describían una mancha luminosa de unos 7º de tamaño angular, que se movía lentamente y se fue disipando en unos 20 minutos. Esta apariencia cuadra muy bien con los efectos de un experimento en la alta atmósfera. Para comprobarlo, revisamos los anales de lanzamientos desde la base francesa de Hammaguir en el desierto del norte de frica y hallamos que tanto el 9 como el 15 de febrero de 1964 se lanzaron sendos cohetes Centaure para sembrar en la atmósfera, respectivamente, Na (sodio) y Ba (bario) y crear nubes luminiscentes artificiales, que es lo que se vio desde tierra en ambas ocasiones. Nos complace adjuntar seguidamente copias de primera generación de dichas fotografías. FOTO 6: Gráfico con la altitud de 8 diferentes aviones desde los que se testificó la presencia ovni. © CBA International. Hay una entrada múltiple en FOTOCAT sobre una impresionante manifestación celeste ocurrida sobre varias localidades japoneses a las 6,14 de la tarde del 3 de octubre de 1971. Fue la revista de la organización japonesa CBA International (UFO News) quien informó concienzudamente del caso en su número de agosto-septiembre de 1974, con un amplio dossier al respecto. Lo más importante de este incidente es que fue avistado por las tripulaciones de varios aviones comerciales. En Europa, fue Inforespace, la excelente revista del SOBEPS, la que se hizo eco del suceso, siendo comentado por Jean-Luc Vertongen en su número de septiembre de 1976. Aquella tarde-noche, una poderosa bola de fuego iluminó los cielos cerca de la posición donde la Luna se hallaba. Fue observada por gran número de ciudadanos, que se apresuraron a denunciar el hecho a la policía, a observatorios meteorológicos y a los periódicos. Durante unos 30 segundos la atmósfera se encendió con su paso. Se consiguieron, al menos, cinco diferentes series de fotografías del trazo luminoso, en las ciudades de Sapporo, Hokkaido y Honshu. Seguidamente presentaremos tres de esas fotografías. Siguiendo una de esas leyes no escritas de la ufología, por las que cualquier observación ovni testimoniada de forma masiva termina teniendo una solución convencional, resolví consultar el archivo que la NASA tiene en la red con datos de las reentradas espaciales. En Space-Track comprobé que sólo una caída de chatarra espacial había tenido lugar aquel día, se trataba del cohete que puso en órbita a un satélite ruso, lanzado justamente cinco días antes. Creo que hay gran posibilidad de que el bólido visto sobre Japón el 3 de octubre de 1971 fuera, en efecto, la reentrada del cohete lanzador del Cosmos 441, que entiendo era la tercera fase de un cohete del tipo Voskhod 11A57. Seguidamente aportaba una serie de explicaciones técnicas corroborativas que situaban el proceso de reentrada espacial a la hora precisa sobre la zona del Japón desde donde se observó el fenómeno luminoso. Los interesados en estas precisiones científicas las tienen en la sección en inglés (arriba) de este mismo blog. En ufología pocas cosas hay tan definitivas como una exacta explicación para un avistamiento ovni. Como en el presente ejemplo. Nuestro colega Ole Henningsen, respetado estudioso de Dinamarca, ha tenido la gentileza de mandarnos unas fotos sacadas por Viktor Svendsen, turista danés en la costa sur de la isla de Gran Canaria en la memorable tarde del 5 de marzo de 1979, cuando los efectos del disparo de dos misiles Poseidon, lanzados desde plataformas en inmersión de la marina de los EE.UU. en el campo de pruebas del Atlántico, fueron divisados por muchas personas, españoles y extranjeros. Las imágenes no son muy impresionantes, pero se añaden a una enorme colección de fotografías que el proyecto FOTOCAT ha recogido de este suceso que algunos malintencionados siguen tratando de pasar como ovni. De hecho, aquel atardecer fueron cuatro los misiles lanzados por submarinos de la US Navy, pero sólo se observaron desde las Canarias los efectos de dos de ellos. A los lectores interesados en saber más del tema, les aconsejo este trabajo definitivo: “¡Identificados! Los OVNIS de Canarias fueron misiles Poseidón” (por Vicente-Juan Ballester Olmos y Ricardo Campo), publicado en la Revista de Aeronáutica y Astronáutica, marzo de 2001, y que pueden encontrar en este enlace de Internet: http://www.ikaros.org.es/misiles.htm Hay traducción francesa en La Gazette Fortéenne, agosto de 2002, páginas 229-246, y versión inglesa en and la prestigiosa revista del CUFOS, International UFO Reporter, julio de 2005, páginas 3-9 y 26. Por coincidencia, estaba revisando los archivos fotográficos del CEI de Barcelona sobre este caso cuando recibí estas nuevas fotos. Y entre los materiales que estaba repasando, acerté a encontrar una fotografía desconocida de este suceso. La foto es de poca calidad, pero no me resisto a facilitarla aquí porque muestra la magnífica pluma dejada por el misil balístico en su vuelo. Desafortunadamente, no se sabe el autor de tal fotografía. Y hablando de recuperar viejas fotografías y de lanzamiento de cohetes, Ole Henningsen también me entregó otra foto conseguida por un ciudadano danés de visita en Sóller (Mallorca) en la tarde de otra fecha famosa, el 12 de junio de 1974. A las 22,00 horas de ese día, un misil balístico francés MSBS fue lanzado desde el Centre D’Essais des Landes en Bisscarrosse. La traza luminosa del disparo pudo ser observada por multitud de personas desde España y Francia y muchas tiras de negativos fueron logrados por los afortunados observadores. Vemos claramente años-oleada en 1952 y 1954, con el doble número de informes denunciados que el resto de los años. El año más pobre de todos, en cuanto a contabilización de avistamientos fotográficos se refiere, fue 1951, con la mitad de casos que los años que no fueron oleada. A grosso modo, el 50% de los casos está explicado, y otro 50% no. Los casos resueltos, sin embargo, suponen 3 puntos de porcentaje por encima de los casos clasificados ovni. Esta media es bastante constante a lo largo de la década, como seguidamente comprobaremos gráficamente. Solamente los años 1950 y 1955 se desvían de este canon, haciéndolo de forma opuesta. 1950 tiene el mayor porcentaje de casos explicados, probablemente por el efecto de los muchos casos de fotografías de globos en Méjico, las falsas fotos de humanoides del mes de abril varias fotos de Adamski en el conjunto. Por el contrario, 1955 muestra la tasa mayor en casos inexplicados, para lo que no tengo respuesta aún. Como era de esperar, Estados Unidos de América resalta como la nación estrela en cuanto a cómputo de casos de fotos ovni, sobrepasando considerablemente a cualquier otro país. De hecho, EE.UU. por si solo acumula el 54% de todos los casos de la década. Le siguen –de lejos- Italia y Francia, probablemente por su prominencia en la oleada de 1954. • Sin entrada para esta sección. FOTO 13: Una de las tomas generales del “platillo volante” que presuntamente había volado sobre El Saler (Valencia), el 5 de marzo de 1969. El 27 de diciembre de 2006 fallecía el empresario catalán Rafael Farriols Calvo, mejor conocido en este mundillo por haber escrito en 1969 con Antonio Ribera el libro Un Caso Perfecto, dedicado a las fotografías (trucadas) de San José de Valderas de junio de 1967. Obsesionado hasta la compulsión por los informes supuestamente procedentes del planeta Ummo (aunque maliciosamente creados en realidad por el madrileño José Luis Jordán Peña), Farriols acumuló el mayor archivo existente en torno a este tema, que sólo ha engañado a crédulos y a aquellos que se han dejado obnubilar por sus creencias preconcebidas. FOTO 14: Ampliación de otra de las fotos de la serie de El Saler. Al hilo de esta luctuosa noticia, quisiera recordar una anécdota de mi encuentro personal con Farriols. En abril de 1969 yo dirigía el CEONI, una asociación ovni instalada en el campus de la universidad de Valencia. Un día, al recoger el correo en nuestra sede financiada por el Colegio Mayor A. Salazar, hallé una carta de alguien que describía el avistamiento de un verdadero platillo volante sobrevolando la Playa de El Saler (Valencia), el 5 de marzo de 1969, del que se adjuntaban varias fotografías sacadas al mismo, con la particularidad de que en su base aparecía dibujado el emblema ummita )+( que recuerda a la letra cirílica rusa Ж.
FOTO 15: De izquierda a derecha, Rafael Farriols, V.J. 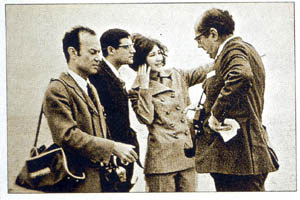 Ballester Olmos, la secretaria del CEONI y Antonio Ribera, Playa de El Saler (Valencia), abril de 1969. El remitente, que no se identificaba, me citaba el siguiente sábado noche en una cafetería cercana, precisamente adonde solíamos ir los miembros del CEONI a tomar algo después de nuestras reuniones semanales. Ni corto ni perezoso llamé a Antonio Ribera (nuestro experto nacional en Ummo) para darle cuenta de las fotos...y el sábado en cuestión tenía al tándem Ribera-Farriols en Valencia en pos de corroboraciones imposibles. En resumidas cuentas, cuando fui a la cita convenida no apareció nadie, con la consiguiente decepción general. Al día siguiente, varios de nosotros, junto con nuestros visitantes catalanes, fuimos de expedición de encuesta a la playa valenciana, sin obtener ninguna pista que confirmara la presencia ovni. FOTO 16: Recuerdo final, la amable dedicatoria de los autores de Un Caso Perfecto. Meses después, una pareja de novios, estudiantes de Medicina y miembros del CEONI me confesaron que había sido una broma inocente y que se asustaron al ver el despliegue montado aquel sábado, incluyendo la presencia de santones como Ribera y Farriols. La verdad es que aquella primera y única broma que he recibido en mi larga vida ufológica -a mis escasos 20 años- me sirvió para poner los pies más en tierra y ayudó a configurar un sano escepticismo que creo debe servir de guía a cualquier investigador que busque la verdad en esta enrarecida investigación. Rafael Farriols, descanse en paz.